Last month, we reported on Library Journal’s and School Library Journal’s survey of public and school libraries, which indicated that e-book acquisition continues to rise steadily in both settings. However, demand for e-books was found to be lackluster in public libraries and downright disappointing in school libraries. Nielsen recently conducted a study that sheds some more light on e-book usage, specifically among teens. Although teens today are more technologically adept that ever before, 13-17 year olds are slightly more likely to be reading print than adult age groups. For the study, Nielsen combined data from two separate online surveys that together represent 9,000 book buyers from across the U.S. The study found that despite teens’ openness to new technologies and e-books in particular, just 20% of teens are actually buying their reading material in this format, compared to 23% of 18-29 year-olds, and 25% of 30-44 year olds. Economic and parental restraints are cited as possible causes, in addition to the fact that libraries and bookstores are still the primary outlet for obtaining books for more than half of teens. Though the study does come with the caveat that it appears teens today are reading less for pleasure than previous generations of young people, selection of materials among teens who read remains a very social process that is aided by newer technologies and social media. For example, nearly half (45%) of teens are at least moderately swayed by how books are portrayed on sites like Facebook and Twitter. And the rampant success of many YA series could be partially explained by the finding that three-fourths (76%) of teens cite the author’s previous works as an influence on future selections. With 80% of YA readers over the age of 18, however, both public and school libraries should be concerned with how to capture young readers in all of today’s available formats. Librarians have long been advocates for the privacy rights of ordinary citizens, whether they are protecting citizens from the government, corporations, or even libraries themselves. While it is not news that Americans are increasingly concerned about the status of their personal information, the extent to which they are concerned about their privacy across various media platforms, delineated in a new survey by Pew Research Internet Project, is staggering. Pew surveyed 607 American adults about their perceptions of their own data security (“security” being the word most closely associated with “privacy” in Americans’ minds for this study), and almost all (91%) of the respondents agreed that they felt a lack of control over what information is collected by the government and commercial entities. Combine this with the fact that nearly all survey respondents (95%) have heard at least “a little” or “a lot” about government surveillance programs, and that those who have heard “a lot” are more likely to feel concerned about sharing information. These data imply that awareness of the issue correlates with heightened insecurity about the status of one’s data. Although respondents said they felt most secure communicating over a landline, out of six communication technologies there wasn’t a single one that they considered “very secure” for sharing private information. It is difficult to discern, however, whom American adults believe should be most responsible for ensuring data privacy. Two thirds (64%) thought the government should be more involved in protecting personal data, and nearly the same amount (61%) felt that they would like to put forth more effort in securing their own personal information. It should be noted, though, that while the survey indicates overall concern and distrust about how information in online environments is used, very few respondents actually had a negative experience as a result of their data trail. Yet these results clearly demonstrate a need in the American community for more information on how to advocate for and ensure the privacy of personal data. 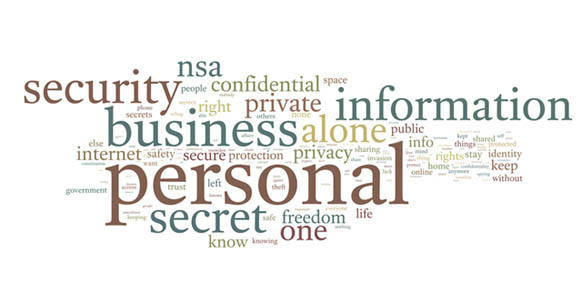 Find the full Pew report on Public Perceptions of Privacy and Security in the Post-Snowden Era here. And, are you looking for resources to help educate your patrons about internet privacy? Check out the Internet Privacy group on DigitalLearn.org. 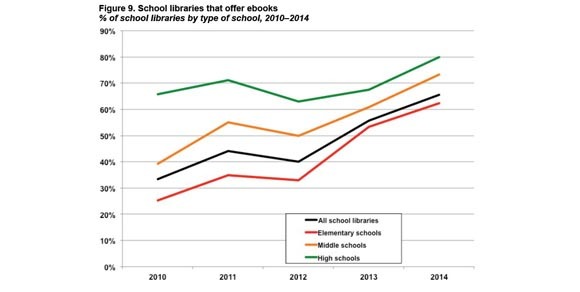 As part of our look at e-book usage in U.S. libraries for 2014, we see in School Library Journal’s latest survey of school libraries that e-books are not faring quite as well in this environment as they are in public libraries. In fact, in the survey of 835 U.S. school libraries, one of the most frequent responses given by librarians is that they are far more enthusiastic about e-books than the students. School librarians report that demand exists but is not astounding, and less than half (44%) have seen demand increase. Although two-thirds of responding schools across the U.S. offer e-books (a 10% increase from last year), a shortage of devices and the cost of e-books were cited as the biggest barriers to access and usage. One growing trend is for schools to provide e-reading devices in a one-to-one ratio for at least a portion of the students’ day. Nearly 1 in 5 (17%) respondents to the SLJ survey have a 1:1 device program in place, and demand for e-books is higher in these schools than in those that do not provide individual devices for students. Different school grade levels also show fluctuations in demand. While the demand for e-books in high schools seems to have peaked, it is actually increasing slightly in both elementary and middle schools. While demand and usage of e-books in school libraries has not displayed the same dramatic trends as in public libraries, the SLJ survey indicates that school libraries are slowly warming up to e-books. Even though meager budgets will continue to be an issue for most school libraries to grapple with, librarians expect e-book spending to quadruple from its current rate by 2019, up to 13% of the total budget. How to get more devices into the hands of students and how to convince them that e-books have something to offer that print books do not, though, will be hurdles that school libraries will continue to face in future years. Do you want to know about e-book collections and usage in Colorado schools? Check out our 2013-14 Annual Colorado School Library Survey Fast Facts, which reports that e-book collections have risen by 557% since 2008-09. In their fifth annual study of e-book usage in U.S. public libraries, Library Journal found that while e-book demand is still on the rise, there has been a significant waning in its intensity, based on the responses from the 538 libraries that participated in their survey. LJ suggests that a strong possibility for this apparent tapering off of enthusiasm is the fact that nearly all (95%) of public libraries now offer e-books, so their widespread adoption may mean that they have successfully integrated into mainstream reading practices. The rise of tablets seems to have helped, as tablets have edged out dedicated e-book readers as the most popular devices on which to access e-books. The little resistance to e-books that does remain is due to a lack of funding for e-book collections and concern over the ease of use, according to LJ. However, a limited collection is no longer a major factor inhibiting e-book usage. U.S. public libraries spent nearly $113 million on e-books in the 2014 fiscal year (on average 7% of each library’s budget), and the median size of e-book collections now exceeds 10,000. Respondents indicated that adult titles account for more than two-thirds of e-book collections, so there is still plenty of room to grow in children’s and young adult titles. 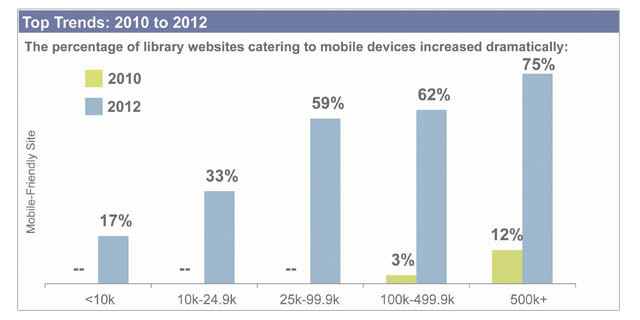 What is next for the future of e-book usage in U.S. public libraries, then? Based on survey responses, LJ predicts that e-books will continue to see increased demand and steady rather than drastic circulation growth. Small and medium sized libraries are still working to catch up to their larger counterparts in terms of e-book offerings, but e-reader lending remains the most popular among this population group. None of the numbers provided by the survey seemed to indicate that e-books were a threat to traditional print. Instead, LJ suggests that e-books are increasingly seen as a complement to other formats. In other words, they are simply becoming more firmly entrenched among the variety of formats that we may interact with on a day to day basis. Banned Books Week and Banned Websites Awareness Day only come around once a year, but for students, learning is affected all year long by the content they are able or not able to access. A report by ALA, Fencing Out Knowledge: Impact of CIPA 10 Years Later, seeks to understand the long-term impact of the law requiring filtering software on school computers, and some of its unintended consequences as revealed through existing research and ALA’s own interviews and symposium. 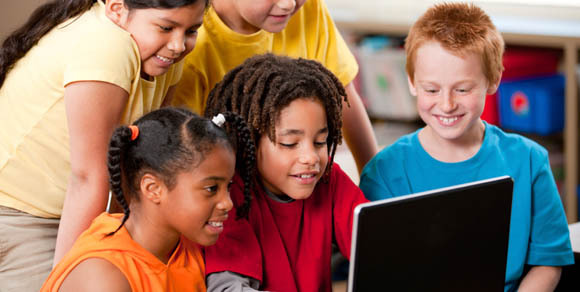 The Children’s Internet Protection Act (CIPA) was passed in 2000 with the intention of blocking obscene and pornographic images from school computers. So why does ALA consider it a problem? While there is good reason to prevent children from viewing certain content, ALA argues that much of this filtering is not very effective and needs to be revised. In fact, software filters are reportedly so unreliable that they over-block useful content or under-block obscene content 15-20% of the time. But the main takeaway from ALA’s report is that CIPA disproportionately impacts already disadvantaged students, giving those who get unfiltered access at home an advantage over those who only have filtered access at school. In a Pew study of AP and National Writing Project teachers, nearly half (48%) of the respondents in urban areas and/or teaching low-income students responded that filtering had a major impact on the effectiveness of student learning. 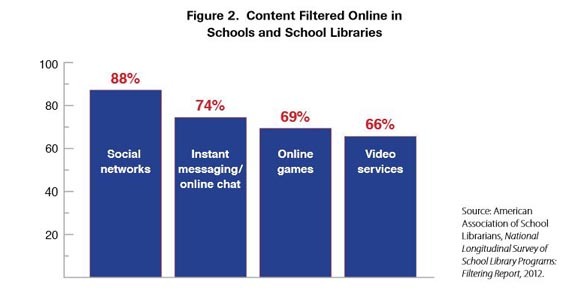 And while much of the filtered content (as shown in the above graph) appears to be entertainment, the fact is that for young people, online platforms such as games, videos, and social networks are a becoming a major component of learning and the establishment of early digital literacy. ALA argues that school librarians have the ability to promote and teach the ethical and safe use of information technologies, and urges that schools should make better use of them to train teachers to assess the quality of online sources and to collect valuable resources for student use. CIPA is likely here to stay, but school librarians are well positioned to mitigate any negative effects it may have on student learning. 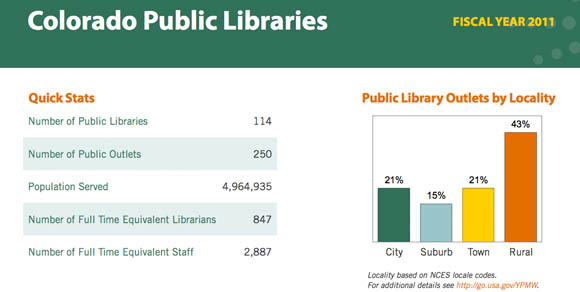 ALA also looked at the effects of CIPA on public libraries. Check out the full report here. Public library websites and social media: What’s #trending now? We’re excited to have an article in the October 2014 issue of Computers in Libraries, Public Library Websites and Social Media: What’s #Trending Now?, that shares the results from our biennial study of public library website features and social media use. In this study, we analyze the websites of nearly 600 US public libraries to determine what website features and social media networks they are using to promote interactivity with patrons. The article focuses on our most recent (2012) findings, with a look back at our earlier studies to examine trends over time. In addition, it shares highlights from interviews we conducted with social media directors at several public libraries from our sample that we identified as highly active social media users based on their number of Facebook and/or Twitter followers relative to their populations served, as well as how frequent and recent their postings were. We talked with them about their social networking strategies, best practices, and lessons learned. Want to know more? We’ve compiled all of our publications related to this study–infographics, Fast Facts, Closer Look reports, and more–on our U.S. Public Libraries and the Use of Web Technologies webpage. Full results from the new Digital Inclusion Survey are now available! We shared some features of this public library study a couple of months ago, but since then the entire set of 2013 results have been added to the interactive tools, reports, and state details. Even better: A two-page talking points handout outlines key highlights from the study and offers easy advocacy messaging you can use right away. You can find the entire Colorado breakdown here. And be sure to check out the executive summary and full report for an in-depth look at the national results, including locale breakdowns (rural, town, suburb, etc.) and emerging trends (maker events, 3D printers, etc.). Want more specifics? When book and e-book volumes, programs, public access computers, and staffing went up, so did physical visits. 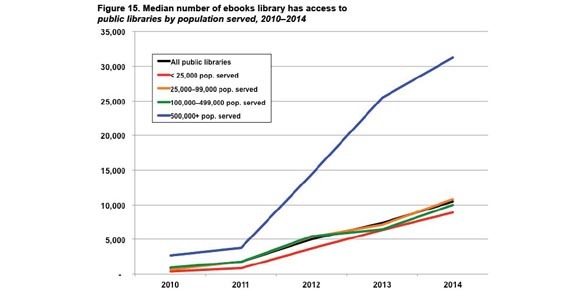 When libraries offered more public access Internet computers, computer use went up. When programming and staffing went up, so did program attendance. And when collections and programs increased, so did circulation. With digital and e-offerings, the picture is a little less clear. Physical visits decreased when investments in e-materials increased, which may be expected if patrons can use more library resources without stepping in the building. However, the report points out an issue near and dear to our hearts here at LRS: We need new survey questions to truly understand what’s happening with e-resources and the delivery and services associated with them. Take a look at the full report, available here. And for a closer look at Colorado and other states, check out the state profile page. You can also access and manipulate Colorado’s data via our interactive tool.